It’s 1am on Saturday morning and the forest has gone quiet again. Much earlier our rather small party left Newbury. As usual we spent the first hour navigating the back roads of Oxfordshire looking for an escape from the traffic before arriving at Haweswater Reservoir shortly after midnight. We had a little faff before skirting around the edge of the lake, under the beam of a full moon to our comfy resting place among the pines on The Rigg. Later that morning, not too early, we had bacon and egg sandwiches before shouldering our heavier than usual rucksacks and started our journey, up. The going was surprisingly good, the weather was fine, and for some reason (possibly the relief of finishing financial year end at work) Sarah had her mojo and was storming ahead. After bagging a few Wainwrights (Branstree, Little HF, Harter Fell and Mardale/Ill Bell), we continued onto High Street where the forecasted early evening weather system arrived at noon. Winds were much higher and as it was too cold to rain, we copped a face full of hail. The cairn on the summit was in a snow drift; so much for global warming. Our progress slowed from here as every navigation choice was carefully made. We went via Thornthwaite Crag, Stoney Cove Pike and Caudale Moor before reaching the Kirkstone Pass Inn. By now we were a wee bit drippy. Well, I think you know how the next bit goes. We all huddle around the fire and review our route options; carefully reading the revised, revised weather forecast. 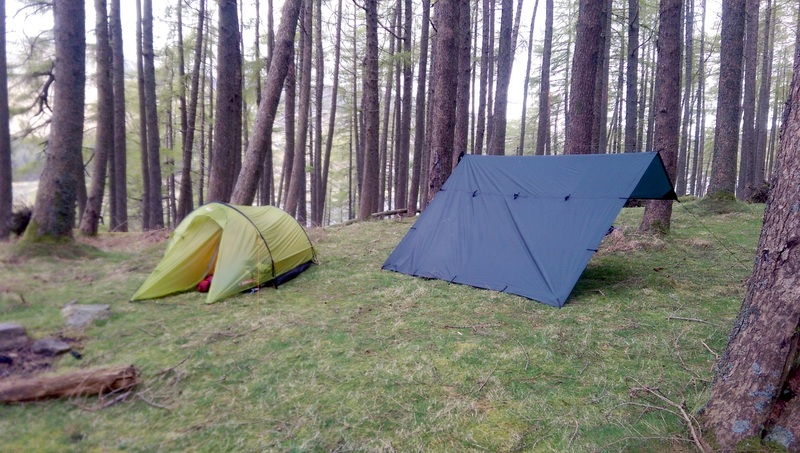 Disappointingly things were only going to get much worse over the next 24 hours, so we decided to avoid camping on high ground that evening and dropped down into Patterdale. On our second day, the only sensible course of action was a long slog back to Haweswater, bashing through whatever weather we could find along the way. We made it to Angel Tarn (and Pikes) with only a stiff gale to contend with, and felt quite happy we weren’t going to stay overnight on this occasion. It was very, very boggy and the Canadian Geese were constantly honking – even the more famed snorers in the club would have complained about the noise. Our journey to Rest Dodd became a very serious challenge as winds were gusting. We walked through the cloud to The Knott and then on to Kidsty Pike. Our final leg was the descent back to Haweswate. Once back at the car, we had a feast of chorizo, couscous and spices before heading home. Beaten by the weather on this occasion, but with many positives to look back on – our equipment didn’t fail and we navigated well in testing conditions. Our tale ends as it began at 1am; Michael is probably in a pain-induced coma, whilst Sarah & I are in the bath, toasting a good trip with Port from our untouched hip flasks (the shame of it)!